All new chapter in the YouTube Words series with data stories that start the same and hopefully lead to something unique. This time around we’re looking at a channel with a large cast with many episodes with characteristics that make things a bit more fun to play with. 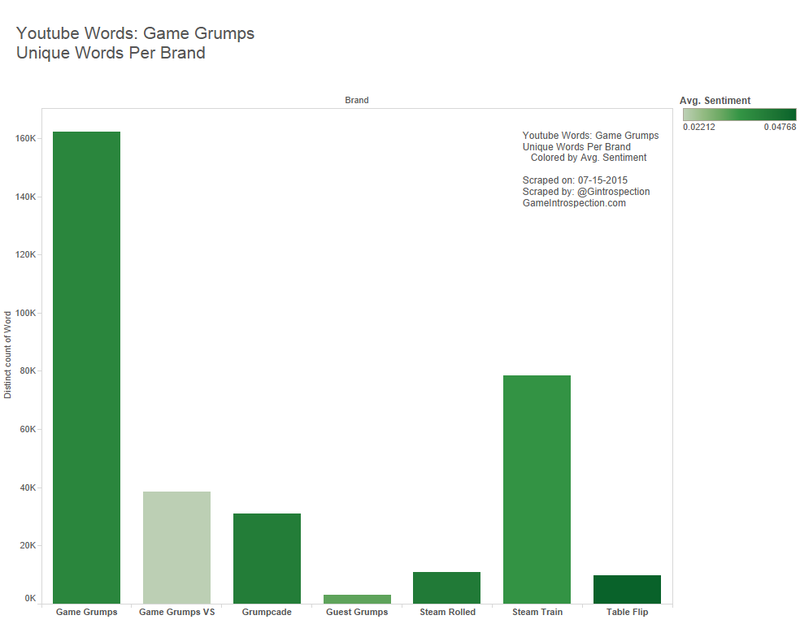 The Game Grumps channel on YouTube can be split across 7 different brands, each with either a static cast or rotating one. 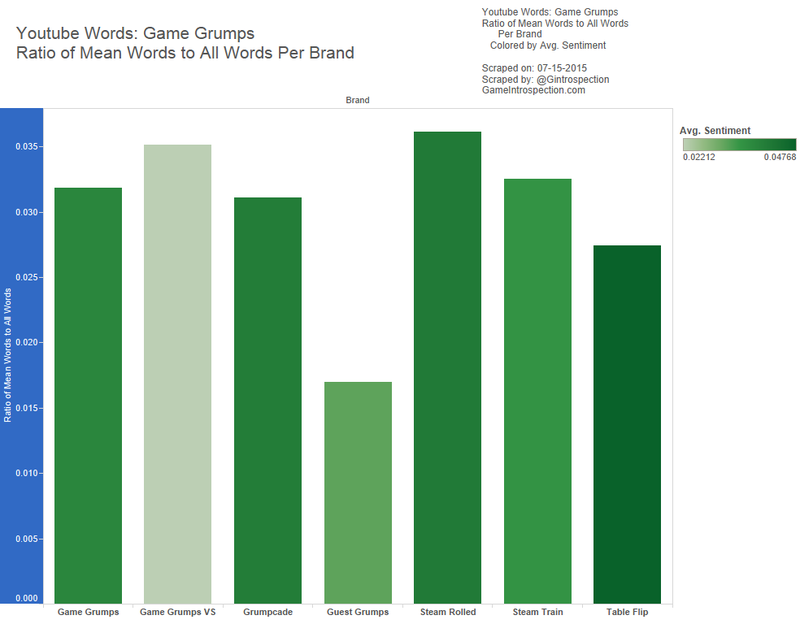 This will be helpful in later posts because the linguistic characteristics change significantly when comparing the different brands, as opposed to our last series with Markiplier who really only has solo and multiplayer episodes to compare against with some regularity. But we can still look at each of the brandings as a whole, after all. And the first of note is the word diversity across the various brands. 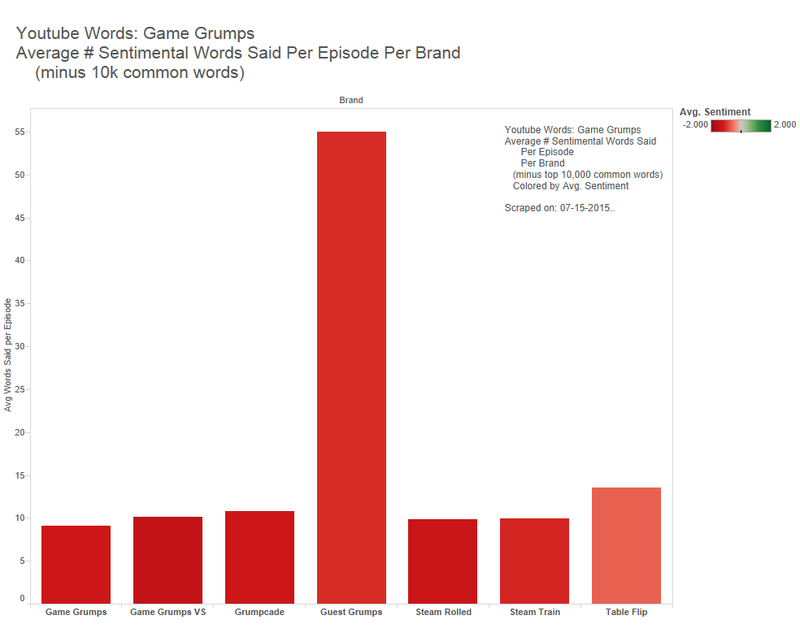 Game Grumps, being the longest-running brand of the channel proves to have the largest vocabulary on the channel, but a series like Game Grumps Vs which has been around for almost as long, albeit with less regularity, has dramatically less word variety. 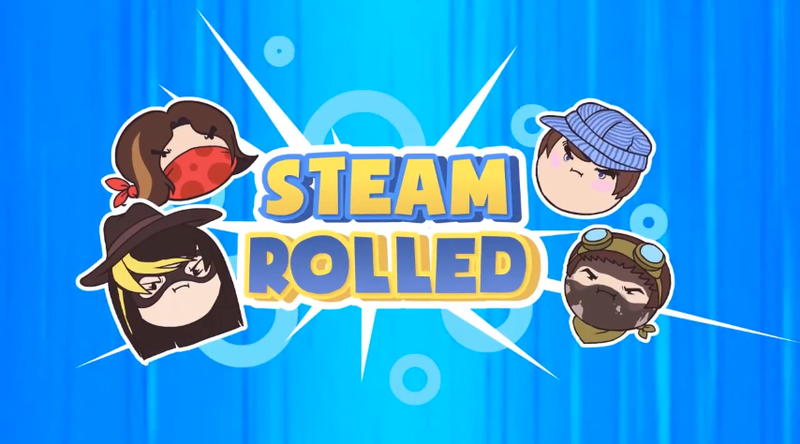 The best way to describe this is because Game Grumps V, Steam Rolled, and Grumpcade, while having many people on the series, are competitive in nature which highly restricts the type of conversation that can take place. You’re focused on your progress or your team’s progress, focused on trash-talk, focused on getting people to not take forever to make a move. 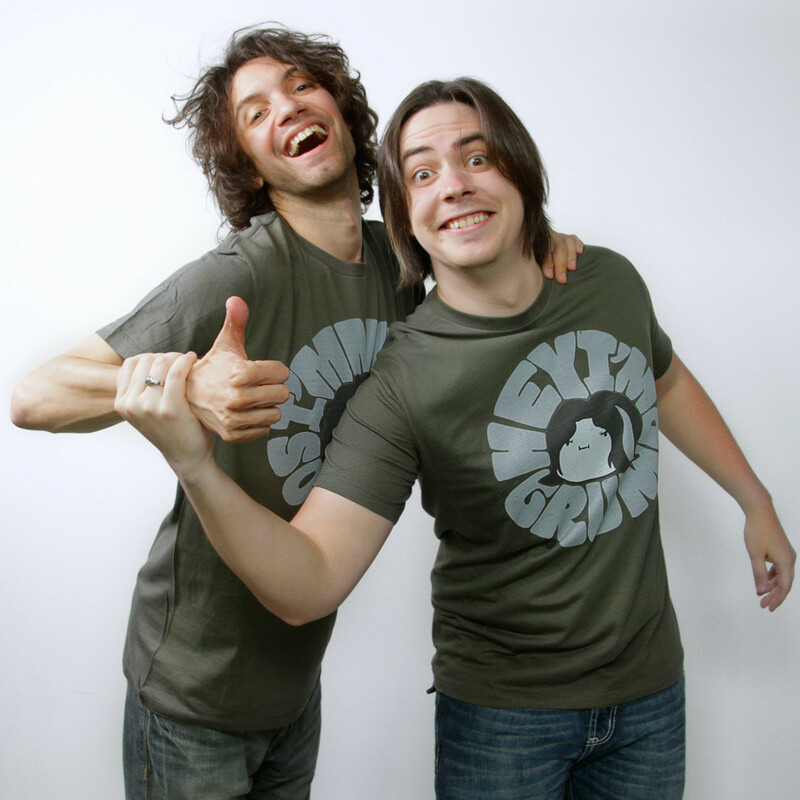 This is in contrast to Game Grumps and Steam Train where while one person might be concentrating heavily on difficult moments in-game, there is typically a co-host there to keep the conversation and commentary going which means the vocabulary isn’t as restricted to a particular event but can lead to discussions about life and what they find interesting or personal history outside of the confines of the game. These moments are more like a podcast than what would be considered a Let’s Play. While the word diversity is high, that doesn’t mean that words aren’t being said. 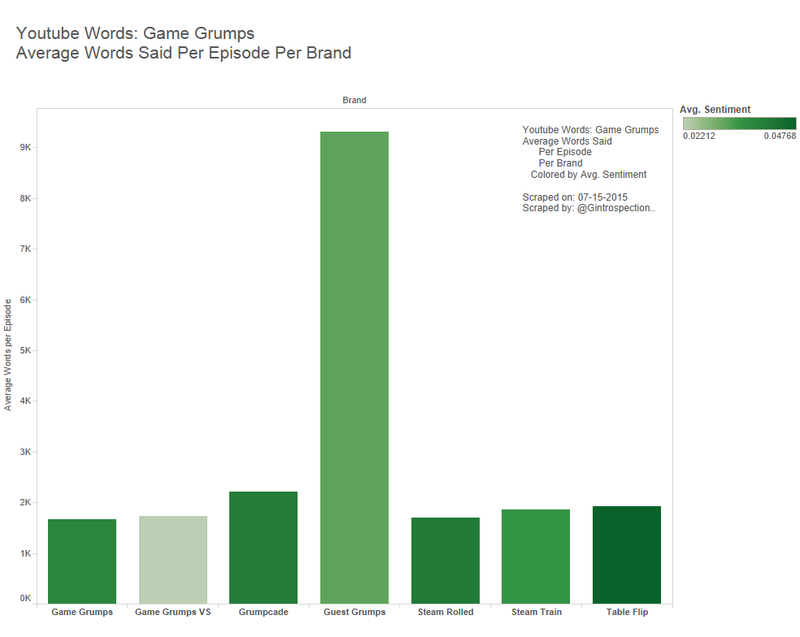 All of the multiplayer competitive series, Grumpcade, Game Grumps VS, Table Flip and Steam Rolled have a higher average word count per episode than Game Grumps. 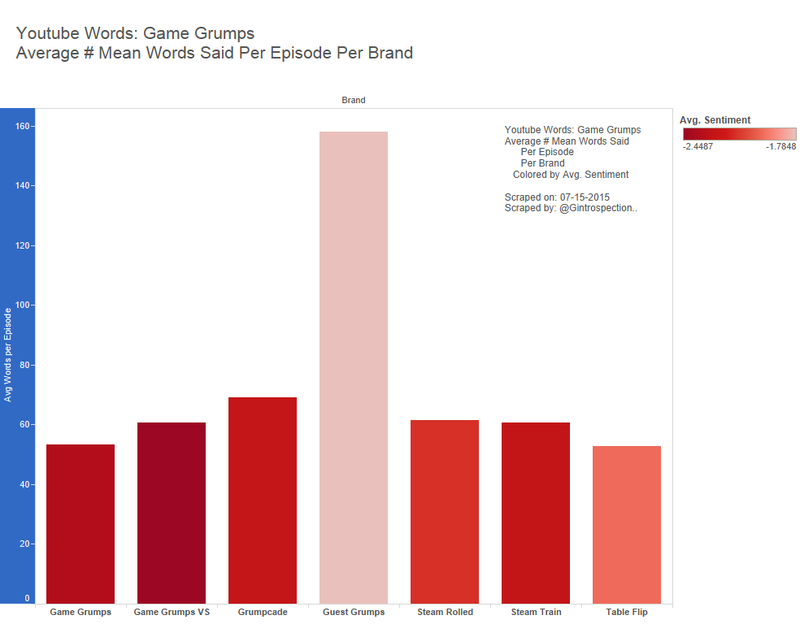 This is if we ignore Guest Grumps which only had one hour long episode rather than 10-15 minute long average episodes for many of the brands on the channel. 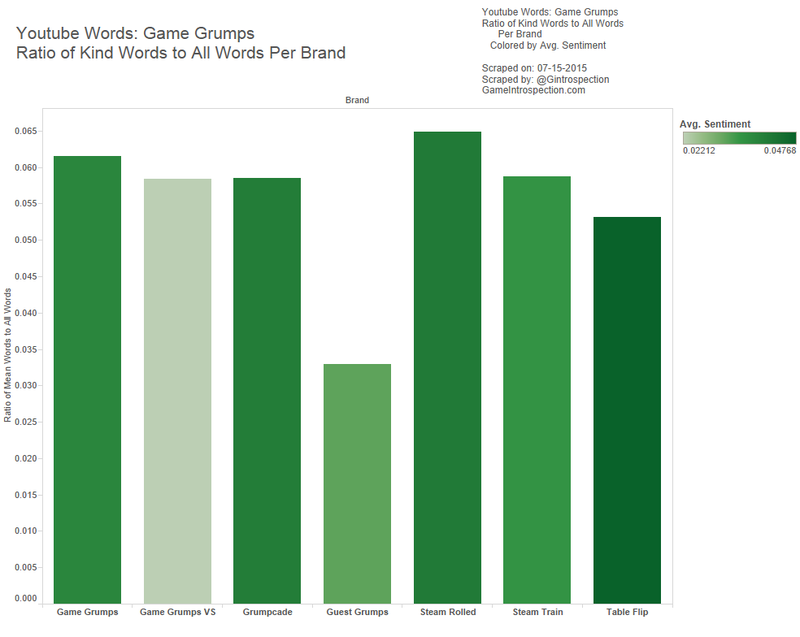 This, in combination with what we just found out about the brands word diversity means that the more people that are playing the game, the more things get said, but the less diverse the topics. Sentiment, once again, is the emotional baggage a word brings with it. Words like hurt or pain or stupid have Negative Sentiment attached to them, while words like kind or hug or smart have Positive Sentiment. You can use this to quantify the general tone of a sentence because given the right confines, when you’re pissed you’re probably going to say a lot of hurtful things towards someone or something. 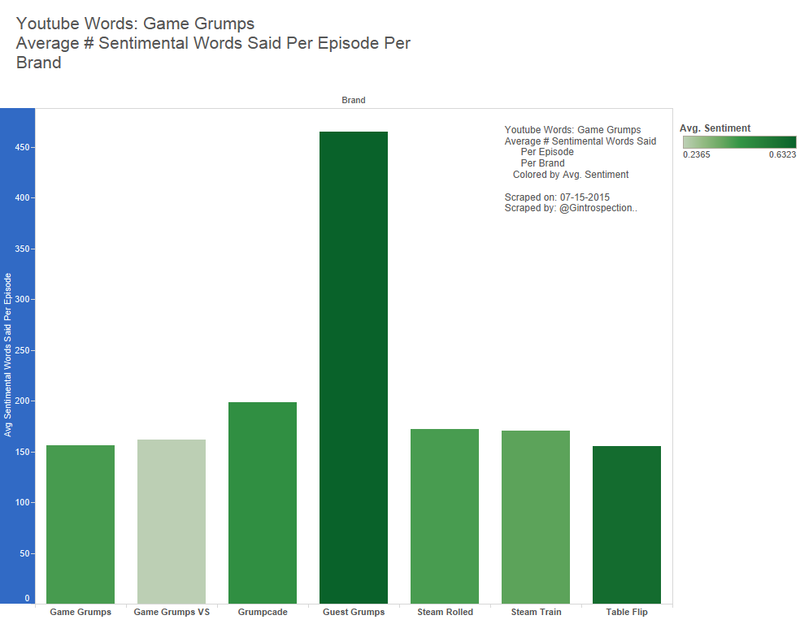 Luckily the Grump, in general, have a good Sentiment about them. Maybe not during Game Grumps VS because there are polar interactions with a constant opponent rather than Steam Rolled where you have shifting situational allies and enemies. 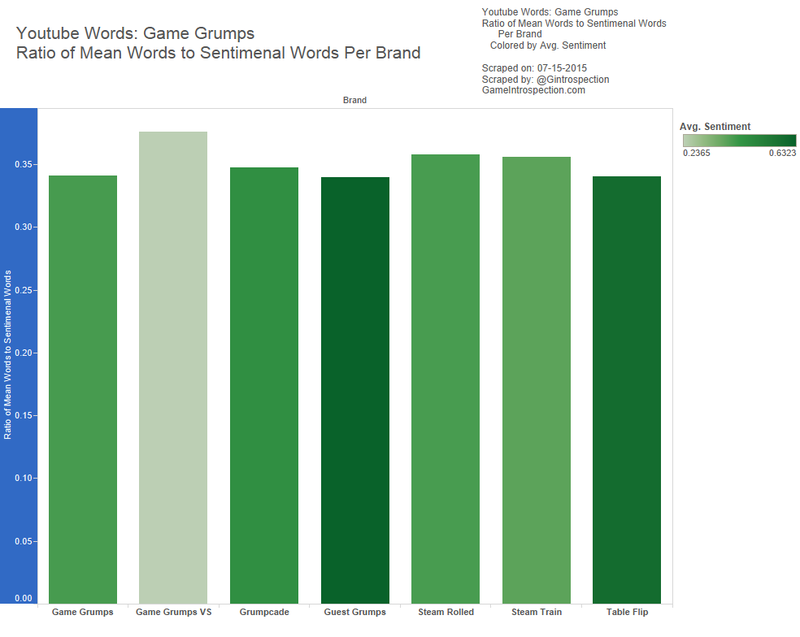 But the problem with Sentiment analysis, if you’ve read the last series, is that not all Sentimental words are attached to emotion. “Yeah!” as in “Awesome” vs “yeah” and is “I understand” are completely different in context. Stripping out all common words (top 10,000 of them), we get something that looks like this. To be fair, I should also create a list of ambiguous sentimental words, but time is limited (thanks Blaugust). 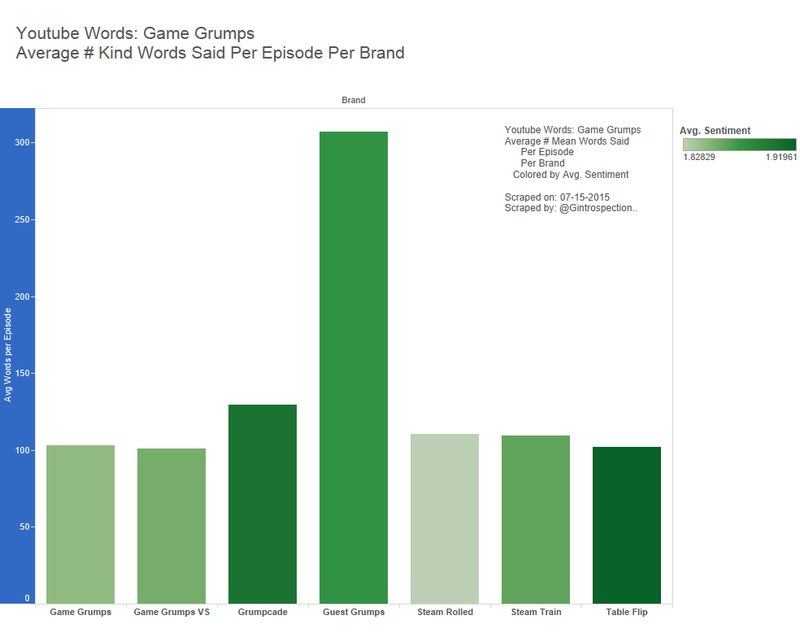 With this list, the tones of the show are bit different, mainly most of the uncommon words that are said on the show are typically negative. That doesn’t mean that they are always negative, just that they typically use common terms to describe their positive Sentiment. The main thing to always remember is that as competition grows, so does the number of mean things said. At least if you’re a Grump.